If you are a fan of yellow curry, then this recipe belongs in your collection. 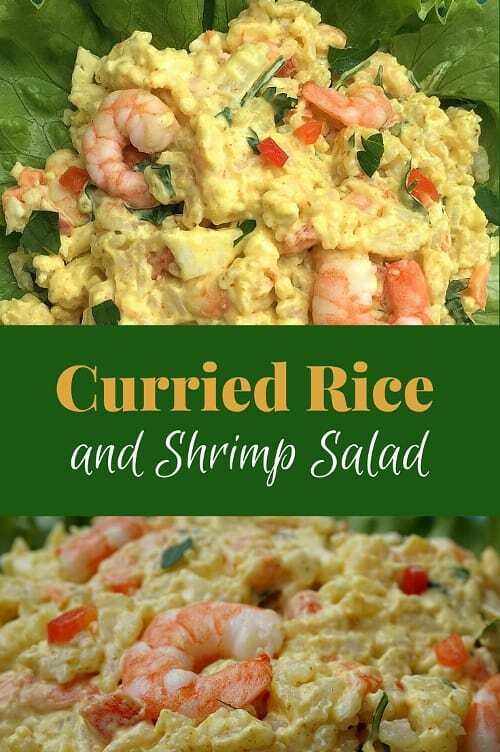 This cold rice salad pairs together spicy yellow curry with crunchy cauliflower and sweet poached shrimp. It’s an ultimate make-ahead recipe because the flavors combine together and taste even better after spending a night in the fridge. Serve it as either a main dish, as part of a salad plate, or as a side dish with grilled fish or with fried chicken. And it’s also a great recipe to bring along to impress your friends at your next potluck. 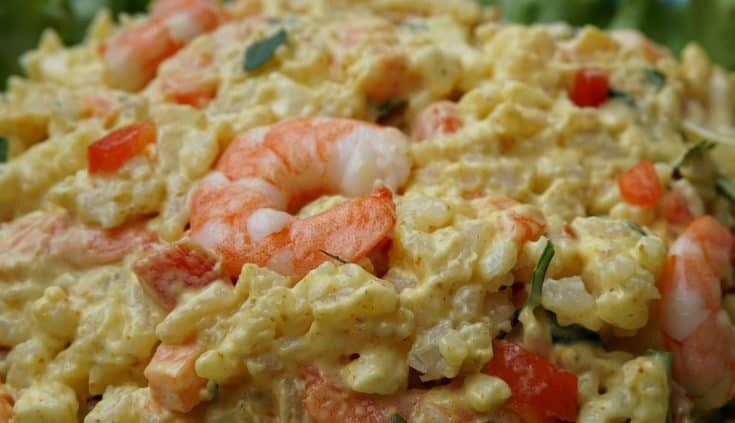 The recipe calls for poached shrimp, but to save some time you can purchase precooked shrimp instead. Add the fresh shrimp to boiling water. Cut a lemon in half and squeeze the juice into water and add the rind to the pot. Boil for 5 minutes or until the shrimp turns pink. Allow them to cool. Then remove the shell and vein from the back. If medium sized shrimp, then cut them in half. Place in a covered dish in the refrigerator until ready to use. Add the rice, olive oil and 1/2 bouillon cube to a sauce pan with 1 1/2 cups of water. Bring it to a boil and then cover and reduce to a simmer. Gently stir after 10 minutes to make sure the bouillon flavor is evenly distributed. Continue to cook until all of the liquid is absorbed and the rice is cooked through (approximately 20 - 30 minutes). If the rice isn't cooked through after 20 minutes and most of the water has already been absorbed, add another 1/4 cup of water. Put the rice in a covered dish and allow to thoroughly cool in the refrigerator (approximately 30 minutes). In a small bowl, combine the mayonnaise, lemon, curry powder, cayenne pepper (optional) and cilantro or parsley. Mix all of the ingredients together. Refrigerate for 2 hours before serving. 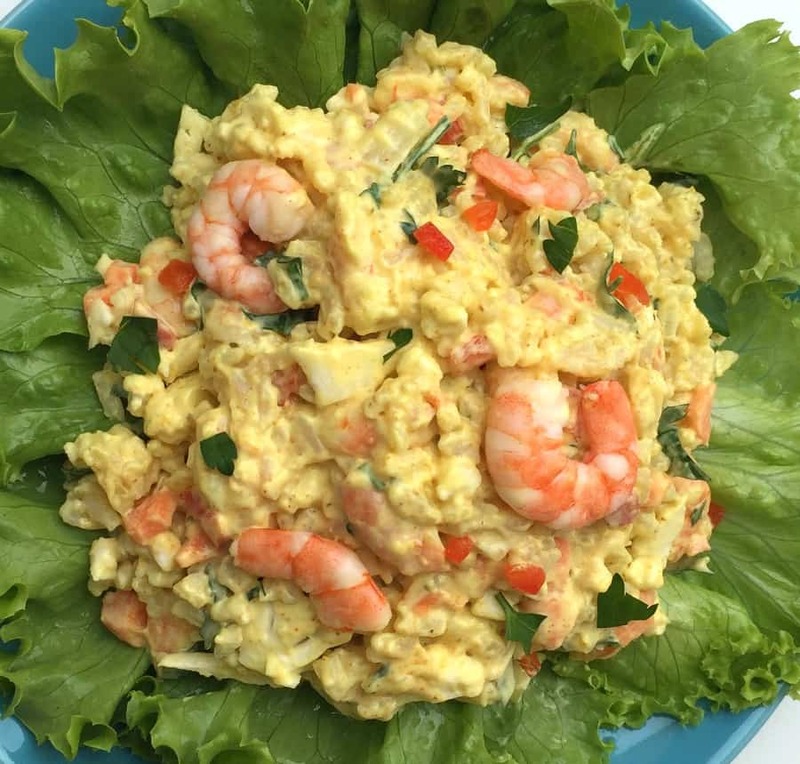 If you like this recipe, you can find a related recipe for Curried Shrimp with Cauliflower, which is perfect for sandwiches or wraps. You can also visit our food finds/recipes section to find our collection of recipes inspired from our travels. Note: Some of the links on this page may be affiliate links, which means that if you click on them or make a purchase, we may receive a small referral fee. So click away! And thank so much if you do – we sincerely appreciate your support!